Here’s the physics. The Earth’s major rivers, with few exceptions, flow from north to south in the northern hemisphere, and south to north in the southern hemisphere. The net result is that a LOT of water (and sediment) flows toward the equator. That moves mass away from Earth’s rotational axis. 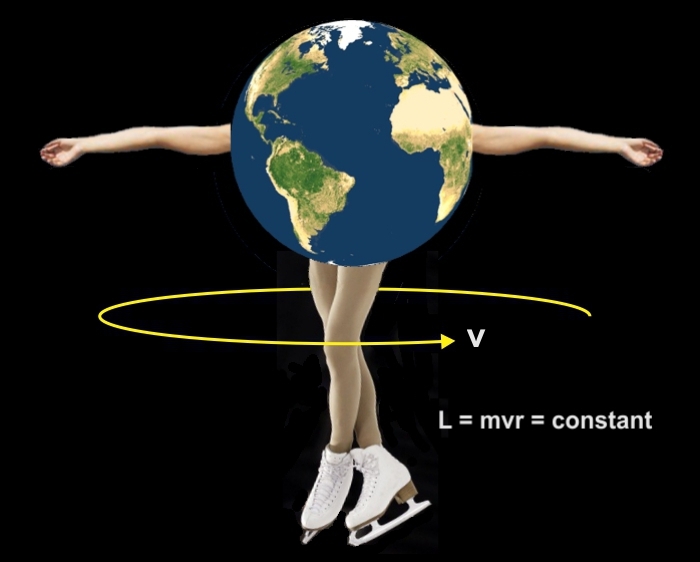 So like when a spinning figure skater extends her arms (moving mass away from the axis of rotation), her speed of rotation slows. And that would lengthen the time of one rotation. The same effect can lengthen the time of one day. This is a consequence of the law of “conservation of angular momentum.” The idea is that angular momentum (L) is a constant, barring any outside torque. So if the radius (r) of a rotating mass (m) decreases, the rotational speed (v) has to increase proportionally [note equation in graphic]. You can see a great video demonstrating that effect here. With no dams, the water gets to the sea, evaporates, and falls as precipitation more or less uniformly around the globe. When you construct dams, you hold more water back away from the equator, and as mass accumulates nearer the axis of rotation (the figure skater raising her arms), the rotation rate would increase and shorten the length of a day. So in that sense, the Science Channel is correct. BUT … this model assumes all other factors held constant. Data clearly show that the Earth’s rotation is slowing over the long term, primarily due to the outside torque exerted by the Sun and Moon. There are short-term reversals of this trend, as well as spikes, but these are more like “noise” superimposed on the general trend. Changes to Earth’s rotation have been caused by melting glaciers, tectonic plate movement, and sediment transported by major rivers. These are small changes, some positive, some negative, but all on the order of fractions of a second. No worries. The atomic clocks that keep track of “official” UTC time are adjusted by “leap seconds” as needed to keep things in sync. See our Local Time vs. UT page. A good example of a spike (rapid change) is the March 11, 2011 earthquake in Japan. It shifted enough mass away from the equator to shorten the length of a day by 1.8 microseconds (µs). See a record of recent short term variations here. You have no doubt heard how, every now and then, a leap second is added to the “official” time by the some international organization. That organization is the IERS International Earth Rotation and Reference Systems Service (IERS). This is done to keep the global network of atomic clocks (which is constant to 1 second in 300 million years) synchronized to the Earth’s rotation (which is not constant). This is usually done in December, but sometimes it’s done in June. Take a look at the last 6 adjustments made in the chart below. You can see a longer list here. Note that leap seconds are not added every year. IERS waits until the difference between Earth’s rotation-based time and atomic clock time reaches 0.9 seconds. The first year leap seconds were added was 1972, when 11 were needed to synchronize the two times. Over the long term, Earth’s rotation is slowing due to outside torque from the Sun and Moon. That torque comes from gravitational tidal forces between the 3 bodies. There is currently some debate about whether “official” time should be set by the Earth’s rotation or by the far more regular global network of atomic clocks. Good arguments can be made for either case. At issue is the internal consistency of time-keeping systems, including GPS, spacecraft, internet, and military.